Venue: Ashvita Bistro, Bawa Road (off TTK Rd. ), Alwarpet, Chennai. 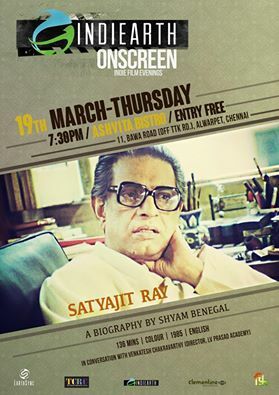 A biographical on Satyajit Ray, one of India’s most significant film makers, who also attained international acclaim through his cinematographic creations, narrated through Shyam Benegal’s lens. Submit your film for further screening opportunities on www.IndiEarth.com& get in touch with us at support@indiearth.com. We’re a small team and our passion for cinema is the only thing that sustains us.